1.In which of the following regions, maize is used as staple food ? 2.Carajás Mine is located in which of the following countries? 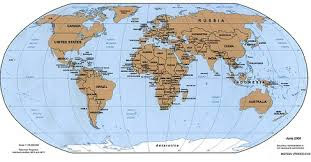 3.Four Corners Monument is located in which of the following countries? 4.Which of the following is not a feature of El Niño Southern Oscillation (ENSO)? 5.Majid Gyre is a feature of which of the following Oceans? 6.The Coriolis force is maximum at __? 7.Bathymetry is related to which of the following studies? 8.Who among the following gave the theory of continental drift? 9.Which of the following were the main gases in the initial atmosphere of Protoearth? 10.Hoover Dam is built on which of the following rivers?